The 90th Gala for Theta Chi's Founder's Day is quickly approaching on April 6th. The 90th Gala will be held from 6:00Pm to 10:00PM. Festivities will start at 6:00PM at the Theta Chi Chapter house where we will showcase all of the new improvements in preserving our legacy. We will be unveiling our new memorial sidewalk. 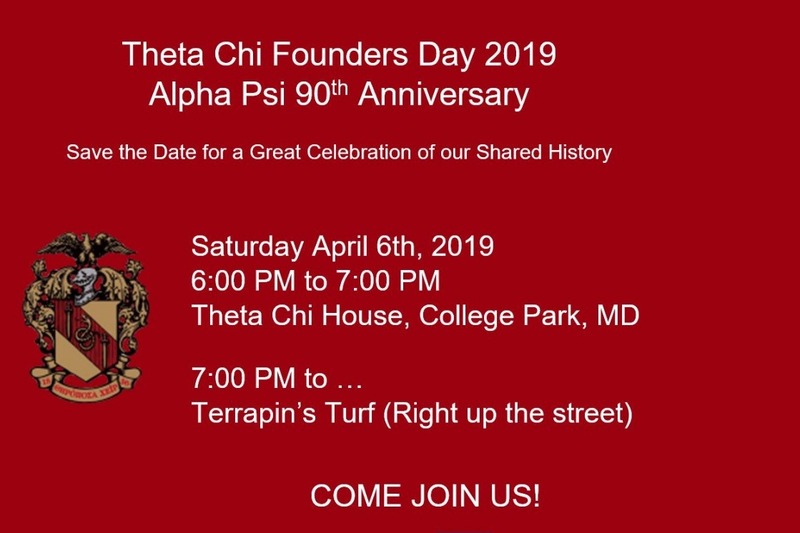 At 7:00PM, we move to the Terrapin's Turf for a private celebration of our brotherhood journey. *$50 - Includes a ticket for two to the event (includes, heavy hors d'oeuvres, music and dancing, silent auction, and cash bar) . The silent auction includes: 1 week vacation package in the Deep Creek Lake area, sports tickets, fishing trips on the Chesapeake Bay, hunting excursions, exclusive Alpha Psi memorabilia, dinners for four ....and the list is growing rapidly as in-kind are rolling in. *$25 - Includes a ticket for one to the event and ALL the fun that comes with it!. *$350- Includes a personalized brick, Life (voting) membership in the Alumni Association, and free crab feasts for the life of the brother. * $150 - Includes a personalized brick, a one year (voting) membership in the Alumni Association, and one free crab feast for the brother (for 2019). * $100 - The sponsor of any additional bricks for brothers who have passed or whom you wish to personally recognize (must accompany one of the above options). Please make your brick and attendance reservations by paying via credit card through this site. Send an email to scputman@att.net with the details of how you want the name (and Spring/Fall + initiation year) to appear on your personal brick(s). Please...no nicknames a this point. If you do not send your pledge semester/year info to the above email address, your brick cannot be engraved. PLEASE DO NOT USE SOCIAL MEDIA TO COMMUNICATE YOUR BRICK ENGRAVING INFO. Do not use an alias on this site. It makes it hard for us to figure out who made the donation. Due to production intervals, bricks ordered after 3/28/19 will be etched into the sidewalk following Founder's Day (you will be notified when completed) . We look forward to seeing you on April 6th!